On Saturday, I went to the launch of 'Diepsloot', by my friend Anton Harber. It was at one of the best bookshops in Johannesburg - Boekehuis in Melville. 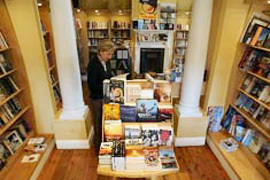 Its a great bookshop. In the invitation for the event, they included a reading list of related books to Anton's that I might be interested in. And while I listened to a very interesting discussion about Anton's book, I looked around at the shelves and was drawn to many books that I didn't know but thought - 'I'd like to look at that'. This morning, I read a Bloomberg report that Amazon's ebook sales now exceed its paper book sales. This is bad for Boekehuis but good for Africa. Because (printed) books don't work in Africa. Most South Africans cannot get access to books. Even Boekehuis cannot make a sufficient profit to justify its existence for its investors. And that's in the centre of one of Africa's great metropolis'. Ebooks represent the greatest hope of distributing, at reasonable cost, a wide selection of books to people in Africa because distribution no longer requires geographic concentration to be viable.